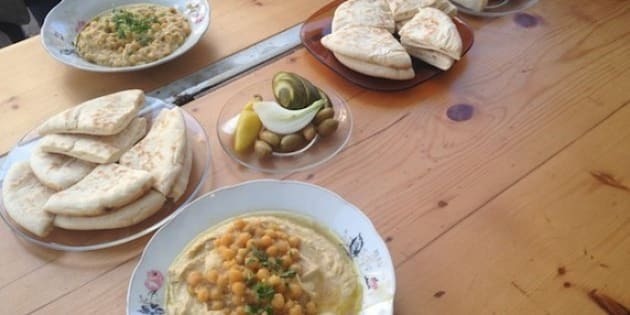 When I announced my trip to Tel Aviv, Israel more than a few people told me the food would be a highlight. And they weren't kidding. The bread, the veggies and hummus are all so good I found myself asking, "Why are we eating what is comparatively garbage in North America?" When I travel I like to do what I call "going on eat-about." It's a combo of eating any local food that appeals to you without restriction (Eat), and exploring the city on foot so as to be affected by its essence (Australian Walkabout). Food crisis aside, here are a few highlights from the feast in the Middle East. The Tiny Iced-Coffee. Coffee culture in Tel Aviv is huge. In fact, Israel is the only country in the world where Starbucks has failed. In Tel Aviv, coffee is a verb, it's something you do. One way to experience this culture is to visit one of the tiny coffee stands on boulevards downtown. I recommend the Tiny Iced-Coffee paired with people watching in the sun. The French Fry Falafel. There aren't too many things that don't taste better with fries on them and falafel is no exception. Falafel is a staple in Israel and there is much discussion about who makes it best. Because I have a mouth that has been destroyed by bland, genetically violated food, all falafel in Tel Aviv tastes excellent to me. The bread is doughy and chewy, the falafel is crispy and flavourful and the fries add a satisfying crunch. Never Eat Western Hummus Again. If you want to be able to eat hummus in North America ever again, do not eat hummus in Tel Aviv or anywhere east of Italy. Just don't. It doesn't matter where you get it, but hummus here is always is creamy, spiced to perfection and could literally be eaten with a spoon. Street Juice. One of the many perks of living in a warmer climate: better fruit. In Tel Aviv, you can find juice bars, stands and market vendors who will blend all manner of fruit combinations into a refreshing life-affirming juice. Most juices are made with world-renowned Jaffa Oranges and are brimming with flavour. Sweet Traditions. Malabi is a Jewish dessert that is considered in some circles a street food. A base of milk pudding perfumed with rosewater, this sweet treat is usually topped with pomegranate seeds. Fresh and delicious this dessert is sold in markets and high-end restaurants alike. Toppings may vary. This Little Piggy Went to Shuk. The more contemporary of the city's many shuks (markets), the Tel Aviv Harbour Market meets the needs of forward-looking Tel Avivians. If the old-world techniques are present here, they are masked behind modern pavilions, young vendors and point of sale machines. Open only on Fridays, this market signals the coming of Shabbat for many locals looking to leave the workweek behind. Young families and couples stroll the stalls buying wines, cheese and fruits all before taking a beer beachside with friends. Breakfast on the Beach at Cassis.Just West of Tel Aviv is the ancient port town of Jaffa. Here you will find Cassis: a beachside restaurant of white and turquoise that offers a sun-filled dining experience. Diners can watch their food creations come to life through the open kitchen. Run by Executive Chef and Owner, Ayelet Perry this popular spot uses fine food and fresh ingredients to put a new spin on traditional Israeli dishes. One of those dishes is a beautiful stacked Israeli breakfast on homemade flat bread. I have to say, Cassis is a dream. The atmosphere, décor and Mediterranean views paired with fresh inventive dishes could melt the hours of any day or night.